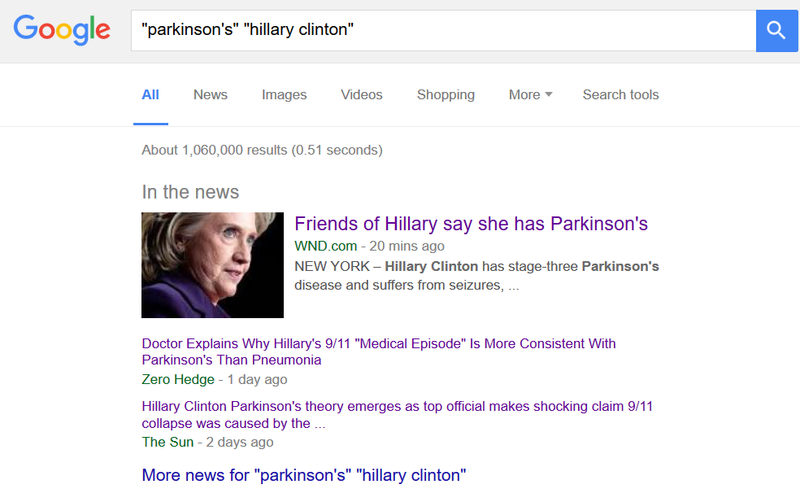 The story concerning U.S. presidential candidate, Hillary Clinton, having Parkinson's disease and the massive cover up, has spread online and in the press like wildfire. Twitter, Facebook, Instagram and You Tube users have disseminated the story to millions worldwide via posts and videos that have landed in mainstream newspapers and on blogs. It is also featured on websites such as Drudge Report and Breitbart, as well as in mainstream papers (and their accompanying sites) the Daily Mail and the Sun Newspaper UK. These four outlets reach a combined total of over 50,000,000 readers worldwide. The story has picked up so much traction, it has over 1,000,000 website search listings on Google, who are struggling to suppress controversial stories on Clinton due to the sheer volume. It is time to call in the real doctors, as the spin doctors have failed.